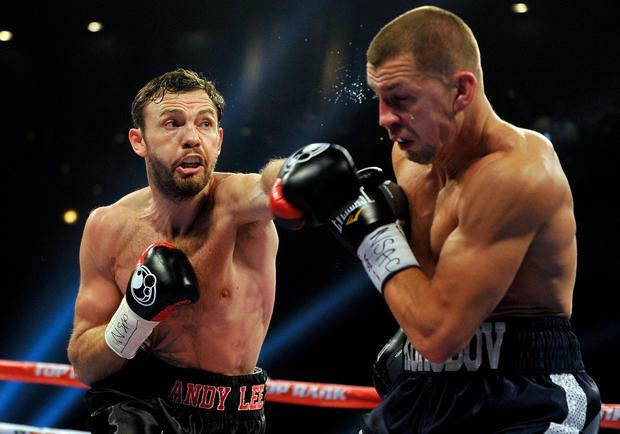 Ireland's Andy Lee became the WBO middleweight champion on a memorable night in Las Vegas. While Amir Khan was outpointing Devon Alexander further down the strip, little-known Lee was knocking out the undefeated Matt Korobov at the Cosmopolitan Hotel. The 30-year-old, who formerly worked under famous trainer Emanuel Steward, stunned his opponent with a right hand and then moved in to finish the job in the sixth round. It is a remarkable achievement for Lee and his new trainer, Adam Booth, and one that is sure to earn him bigger fights and recognition in Great Britain and Ireland. Victory also means he is the first member of the travelling community to win a world strap. "It's tough to describe this moment," he said to the media afterwards. "I am a champion and I want to defend my belt in Ireland and I will fight the best in the world. "I have to say a thank you to this man, my coach Adam Booth, who has done so much for me in the last couple of years - this title is for him before also for the man who made me Emanual Steward." Steward, who coached the likes of Thomas Hearns, Lennox Lewis and Wladimir Klitschko before his death in 2012, had taken Lee, from Limerick, under his wing. The pair lived together and Steward had tipped his man for big things. "I lived with him for seven to eight years and learned so much from him. He said I would win a world title and tonight I made him true," Lee added. Booth, who coached David Haye to the heavyweight championship of the world, added on Twitter that it was his "proudest moment".